When Hotaru Ichijo transfers from a school in Tokyo to the tiny little Asahigaoka Branch School in the rural countryside, she should be experiencing major culture shock. After all, there are only three other girls in the school, and none of them are even in the same grade as her. 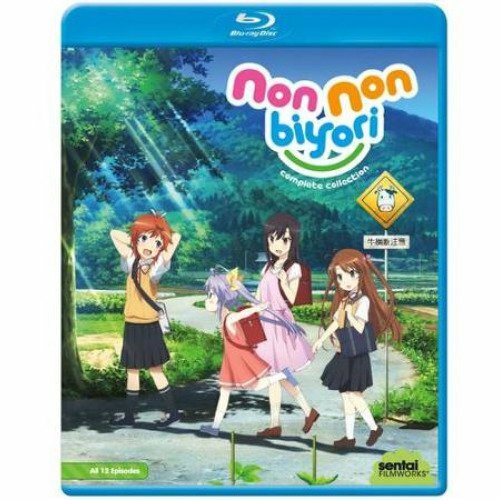 But she quickly finds herself adjusting to spending her time with first grader Renge and the Koshigaya sisters, Natsumi and Komari, who are in the seventh and eighth grade, respectively. The Koshigaya’s older brother, the only male student, isn’t so hard to get along with either. Even if it is 20 minutes by bicycle to the only place that sells comics and the video store is ten train stations away, there’s something about the laid-back lifestyle that makes her feel right at home and comfortable. 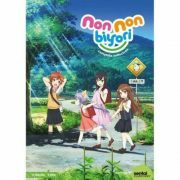 It’s a big change from the big city, but there are still plenty of new adventures to look forward to as Hotaru learns that “home” really is where the heart is in “Non Non Biyori”. Language: Japanese; Subtitle: English.